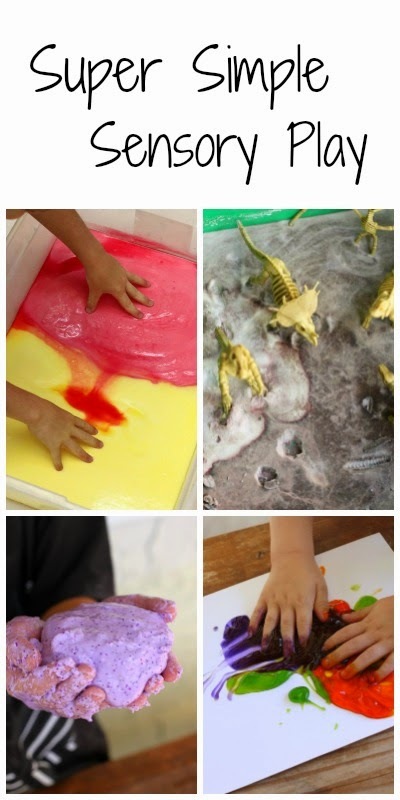 I'm excited to be sharing these four super simple sensory play ideas from Asia Citro of Fun at Home with Kids! About a month ago we received a free copy of Asia's new book 150+ Screen Free Activities for Kids to review, and my boys and I have been having a blast trying out her activities! We love sensory play, and I let my kids each choose an activity from the book to include in our review. J-Bug (5) was immediately drawn to the activities with dinosaurs. We bought our dinosaur fossil skeletons after reading Asia's dinosaurs and sticky mud simple small world. This fizzing dinosaur rescue was every bit as fun as dinosaurs in sticky mud and then some! What boy (or girl!) doesn't love some fizzing fun? These dinosaurs were really stuck! Without the magic ingredient they weren't going anywhere. This activity set the stage for open ended creative play. J-Bug jumped right in and created voices for each of the dinosaurs and had a whole story going before he began to rescue them. Even after the bubbling stopped the boys played for a good hour with the dinosaurs. Peanut (3) loves a good paint recipe, and Asia's all natural paints did not disappoint! There are only two ingredients in this simple paint recipe, and one of them is incredibly moisturizing and gentle on skin. My three year old twins still care more about the process than the end result, but it's important to note that these paints dry glossy and gorgeous. The paints are squishy between the fingers and smooth on the paper. Tank and Peanut painted paper after paper while I prepared their lunch. The small amounts that got on the table washed away easily with water. JZ (7) is obsessed with slime and oobleck, so as soon as he saw this recipe for borax free gak dough he had to try it. It's sort of a mix between the two, yet completely different and awesome. That's my hand in the photo, because yes I couldn't help but dig in and play with the gak dough. It's soft and stretchy and smells incredible! Tank (3) is drawn to bright colors and anything he can run his fingers through again and again. He chose fizzy colored slush, and I added the color mixing element Asia suggested in her book. Tank and JZ, my sensory seekers, couldn't keep their hands out of the mixture. It was soft and slushy, and the colors mixed together beautifully. Even J-Bug who doesn't care to get his hands messy couldn't help but play. The best part? After an hour or so of sensory play, the boys got to make the mixture erupt. How do you make all of these awesome sensory play recipes? Order a copy of Asia's book 150+ Screen-Free Activities for Kids for the step by step instructions for these activities and at least 146 more! We've been working our way through the book and loving all the ideas.